The UK will refuse to pay the agreed so-called Brexit ‘divorce bill’ unless the European Union (EU) backs down on its attempt to force Northern Ireland to stay inside the bloc’s Customs Union. The EU’s demands on Northern Ireland have been described as an attempt to “annex” the province by critical MPs and the Democratic Unionist Party (DUP), who called it “constitutionally unacceptable” and potentially “catastrophic”. The Tories rely on the DUP for votes, and the government has responded in a strongly worded letter to Tory MPs, following the publication of the draft withdrawal agreement Wednesday. Brexit secretary David Davis wrote that the UK would not finalise financial payments to the EU until “all the issues” of concern in the Brexit process had been addressed, The Times reports. Britain has agreed in principle to pay a divorce bill of about £40 billion, although the exact amount will not be known for years. In the letter, Mr. Davis also insisted the UK would not accept “putative sanctions” for breaching any withdrawal agreement and the European Court of Justice having the final power to decide on any disputes, as the bloc has demanded. The EU’s chief negotiator, Michel Barnier, said at a press conference later that Labour’s new policy of keeping the entire UK tied to the bloc’s Customs Union and unable to control trade policy was the best way to keep the Irish border open – as Prime Minister Theresa May has promised. The only other option, Mr. Barnier said, is to form a sea border, dividing the UK internally, between Britain and Northern Ireland – something the Prime Minister has also promised not to do and the DUP has said will vote down. 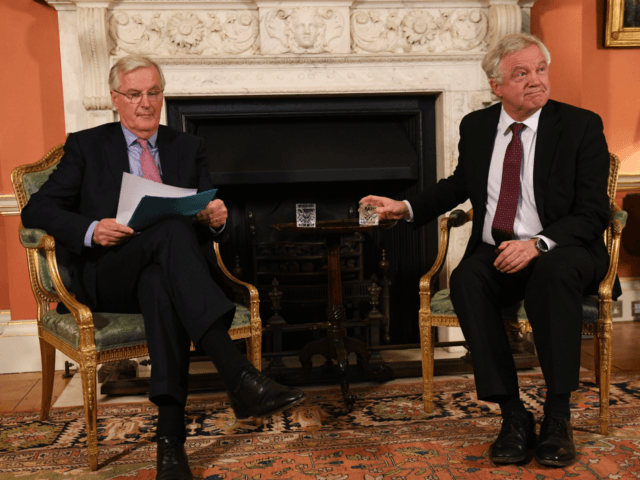 Despite Mr. Davis’s and the Prime Minister’s strong words, they agreed in December to keep Northern Ireland in full “regulatory alignment” with the EU after Brexit, without specifying how the rest of the UK could diverge. Boris Johnson, the foreign secretary, has argued that the Irish border could effectively remain open with customs checks and that the issue is being “politicised” to keep the UK tied to the Customs Union and even the Single Market.